Last week a friend of my that is Web Programming teacher in the University, told me that in is discipline this semester he have to teach HTML 5 and in the first classes we had a lot of difficult to explain to some of the students who are web developer’s the why of HTML5 new tags. When we talk about semantic the students start asking about microdata and all they care about hmtl 5 is the death of flash. This reminds me some discussions i had in the past about HTML and the need to learn and change to HTML 5, so i decided to wirte this post for the ones who are learning/teaching or needing to understand the why of HTML 5. This post is also a “resume” of the way i typically use to teach HTML 5 to developer’s or to explain to some clients what’s HTML 5. Not a long time ago if we make a big search in the HTML development almost all the HTML development on the web follow the following struture, so this structure is not strange. I hope this post can help you to have a better understanding of what are the reason who had take W3C to normalize this new tags, why the name is that and what is the reason for his creation. 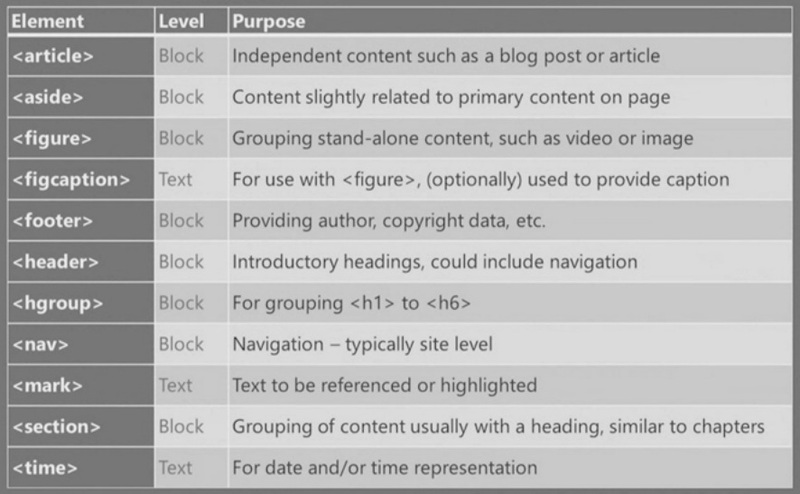 HTML 5 brings a lot of other great things that deserve a look like Forms , Video or Canvas, their are other advanced ways to specefy semantic that worth some of your time study.